The fuel cell and hydrogen related technologies are potential for delivering clean energy and track attention and efforts overall the world, including the sectors of industry, government and academics. The type of proton exchange membrane (PEM) fuel cell possesses the advantages of maneuverable output power, low operating temperature and quick start, which makes the PEM fuel cell suitable for the transportation applications and residential usage. This book is intended for the model analysis, controller design, optimization and potential application for the PEM fuel cells. Though a number of published books have been unveiled in dealing with the similar topics, this book is emphasized on the direct address of compromise between the desired performances and imposed constraints. The model is developed in capturing nonlinear behaviors of the PEM fuel cells, which are characterized by various operating conditions, including the effects of output current, temperature and humidity. To pursue a control design properly following the PEM fuel cells' varying operation conditions, the derived nonlinear PEM fuel cells model is to be transformed into a linear state-space formulation with dependence on the varying system parameters, the current, temperature and humidity. The controller design algorithms then be developed and constructed based on the numerical tractable linear matrix inequality (LMI) algorithms. The LMI algorithms also allow the controllers to be designed in simultaneously considering multiple performances or constraints. Beside the issues of controller design, the book presents also optimal oxygenstoichiometry for maximum net electrical power output of the PEM fuel cells. The optimal oxygen stoichiometry is derived and tuned on-line as functions of stack output current and blower energy efficiency. Also, the book introduces a potential application for the PEM device as hybrid fuel cell-battery power systems for electric vehicles. Both the PEM electrolyzer and fuel cell devices are utilized in this configuration of solar-hydrogen mild hybrid power systems. This book is developed in the basis of the author's several published works, including the Int. Journal of Hydrogen Energy (2011 Feb, Nov), Journal of Power Sources (2012 March), Energy Conversion and Management (2013 Jan), Int. Journal of Energy Conversion (IRECON) (2013 Jan), Journal of Kao Yuan University (2013 Sep) and The Arabian Journal for Science and Engineering (AJSE) (2014 April). As the author's recognition, the issues of model and control of the investigated PEM fuel cells have not been systematically and thoroughly handled by the versatile LMI algorithms. The materials developed in this book are believed to be intuitive and constructive for the readers from the areas of industrial practitioners, academic researchers, and institutional students. The author likes to express sincerely grateful for my academic supervisor, Professor Jeff S Shamma, in leading the author into the field of systems, control and optimization, during the study of PhD Degree in the University of Texas at Austin. Professor Jeff S Shamma is currently in the George Tech and holds the Julian T Hightower Chair in Systems and Control. Professor Jeff S Shamma is also famous for a pioneer on the development of linear parameter varying (LPV) systems and gain-scheduled control during his early research career. The author also appreciates the companies of Professor Chih-Hua Hsu in Chang Jung Christian University and Professor Jung-Chun Liu in Tunghai University during my stay in UT Austin for pursuing PhD degree. 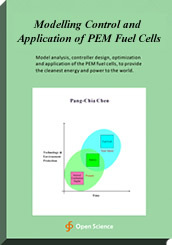 The author is also greatly thankful to Professor Koan-Yuh Chang in Chienkuo Technology University for introducing me to the topics of PEM fuel cell systems and applications. The author also likes to thank Professor Shiuh-Ming Chang in Kao-Yuan University and Professor Po-Ya Abel Chuang in the University of California, Merced, for their helpful discussions on the topic of oxygen stoichiometry optimization. The author is also indebted to my technical editor, Mr. Randy Gillespie, for his great job in helping me for the aspect of technical writing. The author likes to thank my working institute, the Kao Yuan University, for providing a comfortable environment with thoughtful and diligent colleagues and students. Special thanks is to the graduating 104 class students in the Department of Electro-Optical Science and Engineering, who we share some common learning experience and memory, and also we learn together how unique every single life is. Professor of Department of Electro-Optical Science and Engineering & Department of Mechanical and Automation Engineering, Kao Yuan University, Taiwan. The book can be used as a text book for graduate study in the disciplines of energy or control engineering. The materials developed in this book are intuitive and constructive; therefore, it is also useful and suitable for self study for the industrial practitioners and academic researchers.